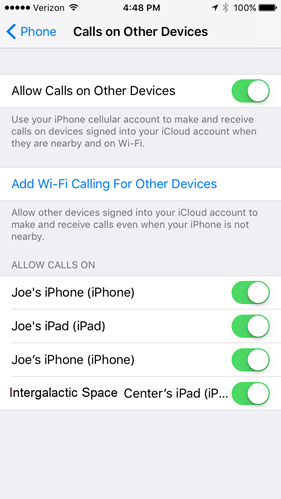 You can use the wireless account from your iPhone to make and receive calls on other Apple devices logged into the same iCloud account. You may not be able to manage calls on other device settings unless you are on the same Wi-Fi network or have enabled Wi-Fi calling. View the Continuidad y Llamadas Wi-Fi support pages for more info. En la pantalla de inicio, ve hasta: Settings > Phone. Tap Calls on Other Devices. Tap the Allow Calls on Other Devices switch to turn on o desactivar . For first-time setup, tap Add Wi-Fi Calling For Other Devices to enable other iCloud devices to make and receive calls. From the 'Allow Calls On' section, tap the switches to turn calling for that device on or off.